Cataracts are a common cause of blindness in dogs. A cataract is a cloudy lens and if dense, is seen as a white pupil. Old age, breed predisposition and diabetes are the most common reasons for cataract development in dogs. Other causes for cataract development include retinal diseases like PRA, however, most of these cases are poor candidates for surgery. Removal of cataracts is only possible using surgery called phacoemulsification. This breaks up the cataract into tiny pieces and removes it through a small incision made in the eye. An artificial replacement lens is then placed in the eye and the small incision is stitched closed with dissolvable sutures. All of this is performed using an operating microscope which greatly magnifies the ophthalmologists view. Although we occasionally perform cataract surgery on rabbits and cats, the majority of cataract surgeries are performed in dogs. When is the best time to perform surgery? Early referral of dogs with cataracts is important. This is especially so for diabetic dogs and dogs with other forms of rapid onset cataracts. This is because lens induced uveitis (inflammation of the eye) is a common complication of rapid onset cataracts. Prolonged inflammation of the eye can reduce the success rate of cataract surgery. The earlier the cataract can be removed, the better the outcome. At the time of surgery, prior to removing the cataracts, tests are performed to check the health of the retina. An electroretinogram (ERG) and ocular ultrasound help us to ensure the retina is functioning adequately. Dogs that have a poor ERG response or abnormal ultrasound may be poor candidates for cataract surgery. Once removed, cataracts cannot recur. After successful cataract surgery, dogs see close to normal. Vision may be blurry for the initial 24 - 48hrs after surgery, depending on the degree of inflammation in the eye. Medication will be given to help reduce the inflammation and pressure within the eye. After cataract surgery most owners notice a tremendous improvement in their pet's behaviour and often comment that they have regained their confidence. You pet is able to go home with you that afternoon after surgery. For those that have come from interstate or regional Victoria, it is possible to leave your pet here with us for 1 - 3 nights. Our clinic is not staffed overnight so if your pet requires monitoring they will be transported to the nearby Animal Emergency Centre. To help prevent unwanted long term complications and vision loss after cataract surgery, topical and oral medications will be prescribed to your pet. Three - four different drops will need to be applied 2 - 4 x daily along with oral tablets twice daily. The medication regime will be gradually decreased over the weeks & months after surgery. Your dog must return to the clinic the morning after surgery for a post operative examination and will also need to be re-examined on day 3 and around day 7 post surgery. Revisits will also be scheduled during weeks 2, 4 and 6 after surgery. This will vary slightly for each dog depending on how their eyes are healing. 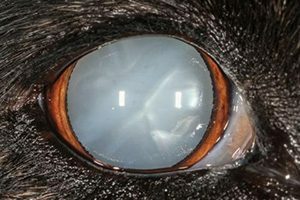 All our veterinarians at All Animal Eye Services are registered Ophthalmology Specialists, we are equipped with the latest cataract surgical equipment and have a team of experienced nurses, so your beloved pet is guaranteed to get the best possible care.